Beautiful and consistently in style, open shelving is one kitchen design trend that's here to stay. For some people, open shelving is both functional and gorgeous, and enthusiastic owners refresh their designs with new or seasonal décor. For others, floating shelves are a good idea in theory, but they present some unique challenges when it comes to design and organization. 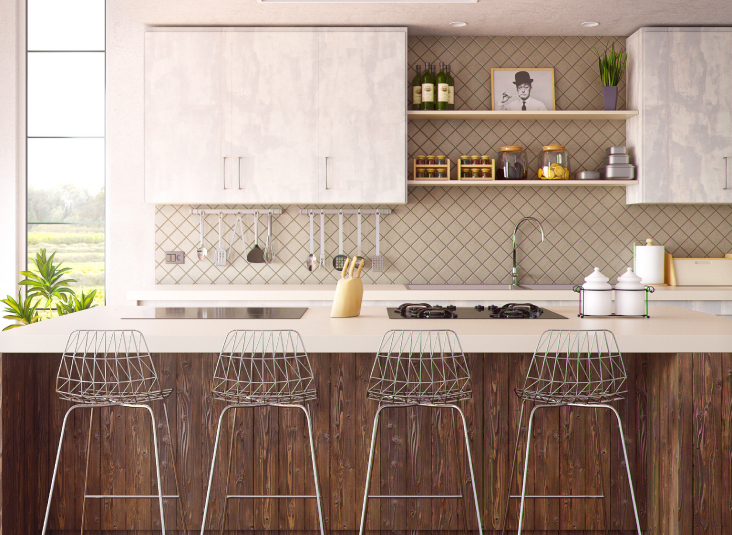 If you're considering adding open shelving to your kitchen, here are 5 tips for success. 1.) Ease into the transition. If you're unsure if open shelving is your thing, take the style for a test drive. Grab a screwdriver and remove a pair of cupboard doors. While this isn't an exact replica of what open shelving has to offer, it's a good first step. And if seeing all your kitchen items on display makes you uncomfortable, you can always replace the doors and pretend it never happened. 2.) Beautify your space by mixing functional kitchenware with decorative items. Add cookbooks, keepsakes, and the vintage knickknacks you love. (All the more reason to visit those yard sales and secondhand shops!) And remember, it's entirely possible to accomplish this look without clutter. It's all about balance and displaying the items that are most pleasing to your eye. Or mindfully rotating your décor selections to keep things minimal and fresh. 3.) Use the bottom shelves for those super functional, everyday items. Bottom shelves are great places for plates, cups, bowls and your favorite cookbook. Save the upper shelving for lesser-used decorative items, like Grandma's porcelain teapot. 4.) Incorporating open shelving doesn't mean it's "all or nothing." Maybe you have a young family or grandchildren who visit (which means sippy cups galore and brightly-colored, plastic dishware.) These are perfect items to keep stowed away in your kitchen's remaining cabinetry. Depending on your wall space (and needs), it's absolutely okay to mix traditional cabinets with a few floating shelves.